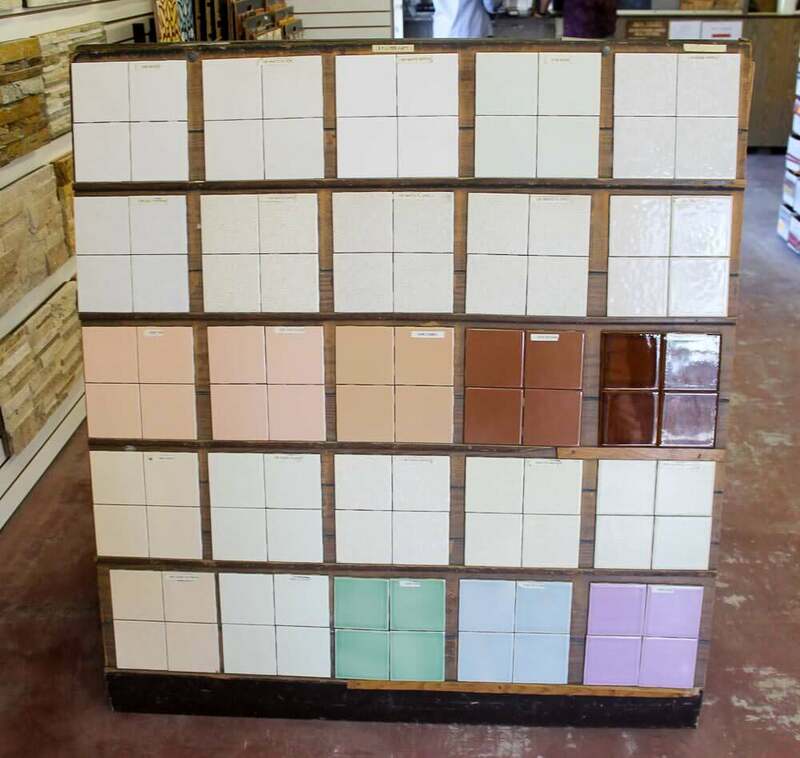 My favorite place to find vintage-pastel-colored bathroom tiles — B&W Tile — has new owners and will be rebranded “American Tile Makers.” Good news: The new owners will continue manufacturing B&W’s line of authentic midcentury pastel colors. However, some of the finishes will be discontinued or are in question. 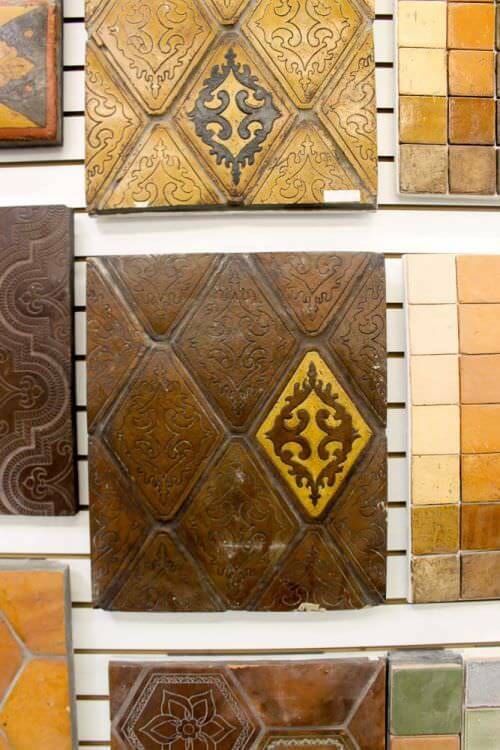 When I visited Los Angeles last week to see The Art of Tiki, I also made a pilgrimage to Gardena to visit B&W aka American Tile Makers to see the showroom and get more details on the change. 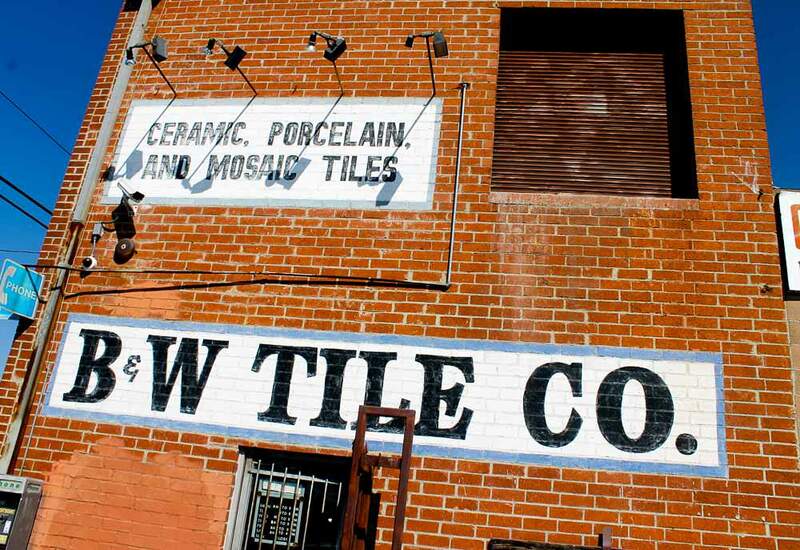 B&W Tile was owned and operated by the same family — the Logans — for 70 years. Ernest Logan launched B&W in 1947. Sons Ralph and Joseph then took over and now in their 80s, finally sold the business. 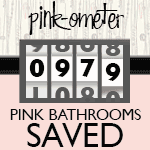 B&W has been notable in our Retro Renovation world because they did their own manufacturing and continued to produce the pastel lollipop colors we so dearly love to use in our vintage bathrooms. Many readers used B&W tiles to create all-new bathrooms that looked like they’ve always been there. You can see them in our category Readers and Their Bathrooms. The Logans were pleased to find another company to take over the business that would continue the manufacturing operations. 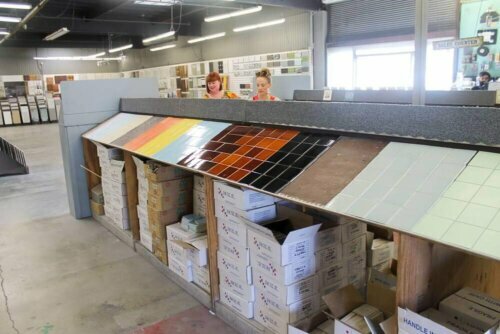 And, they’re pleased that the new owners will be expanding manufacturing and retail operations in Gardena — adding a new tile maker and brand to the lineup. Christie and Humu came with me for the tour. They didn’t know about B&W and pink and all that — but now they do! The new owners are Imperial Tile and Stone. The new brand name store: American Tile Makers (I don’t see a website yet). The most popular B&W Tile designs will continue to be manufactured and sold. 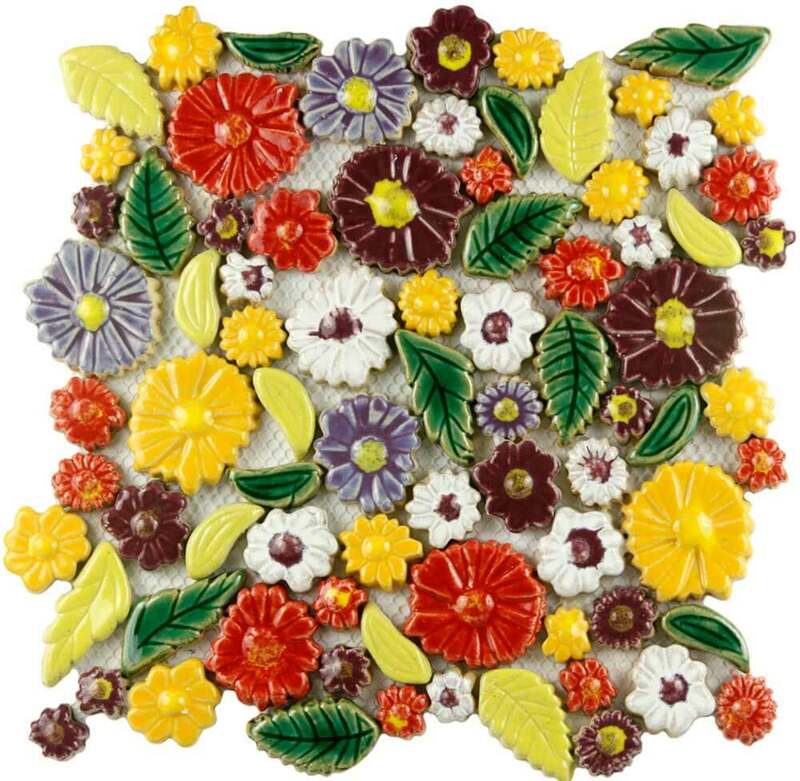 Also coming on-site to do manufacturing will be Ken Mason Tile, which does handmade and custom designs. Imperial Tile also will be sold in the Gardena location. B&W’s former Riverside location is now closed. I loved this tile by Ken Mason or maybe it’s Imperial. But then, I’m in a pirate mood these days what with my Mahalo Lounge project. 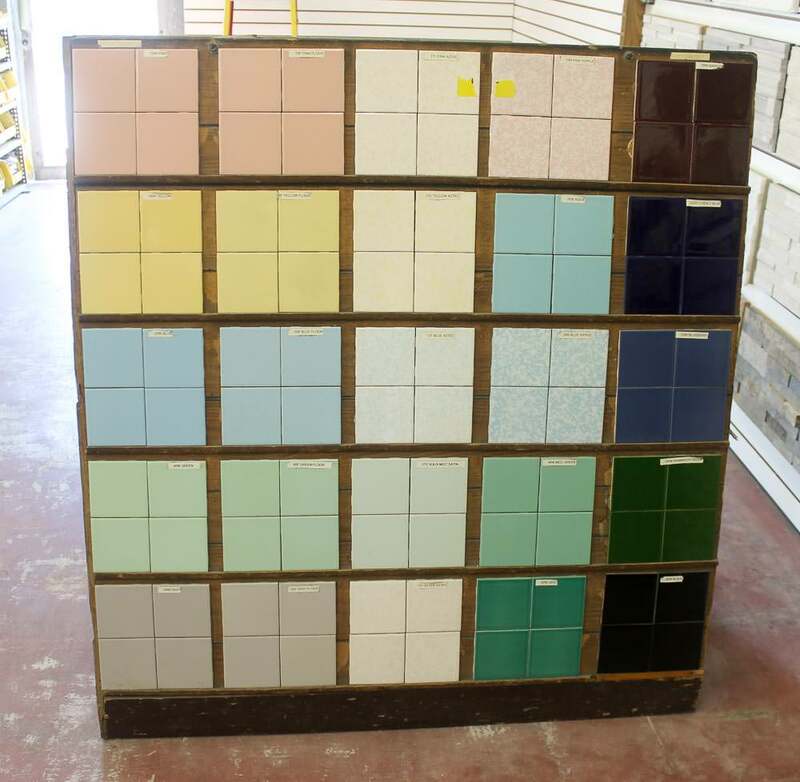 Pastel-colored B&W Tiles in matte and satin finishes will continue to be manufactured. Yes, you can still get your pink or green or blue etc. tile and trim. Hooray! Ripple-finishes will be discontinued except for the white ripple. The new company has not finalized a decision on whether to keep the oatmeal and flecking colors or the Duraglaze finish. 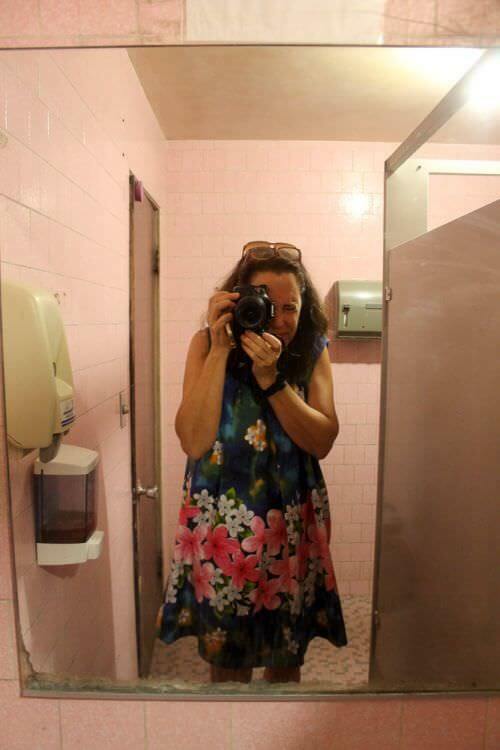 Of course there was a pink bathroom! More photos from my B&W Tour — and the Grand LA Tiki Adventure — to come. FYI: I recently got a quote for pricing from B&W. 1sq ft of 4×4 is $10. bullnose is $14. This is significantly hire than the quote that is on this website for them from 2012 when 1sqft of 4×4 was supposedly around $5. Well I just paid a visit to American Tile. It was great. 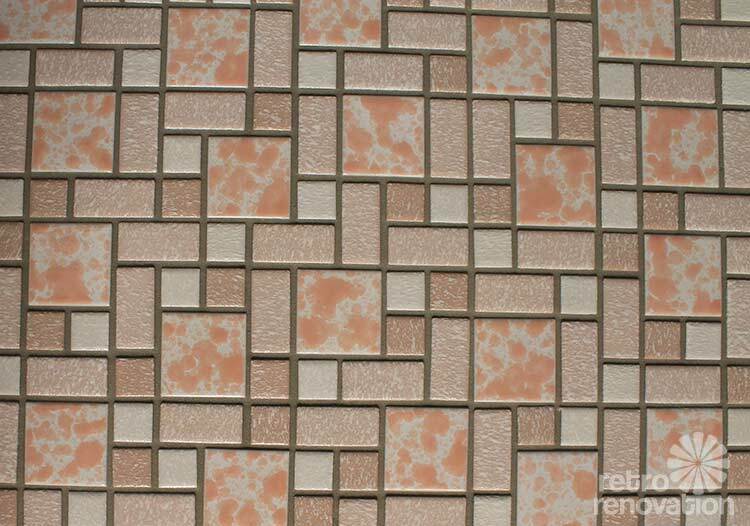 I bought a full bathroom of pink and maroon tile, along with a grey subway tile backsplash for the kitchen. They also had a wonderful parquet 8×8 floor tile in a natural white oak color from another manufacturerthat I ordered for my small front entrance. The help ordering the layout and trim pieces was first rate. While the bathroom floor will not be replicated exactly in the remodel, the feel, look and theme will shout out 1953 mid century when the home was built. I can’t wait to see it installed. About a four week wait at this time for my order to be finished. I am so glad I visited from Michigan. 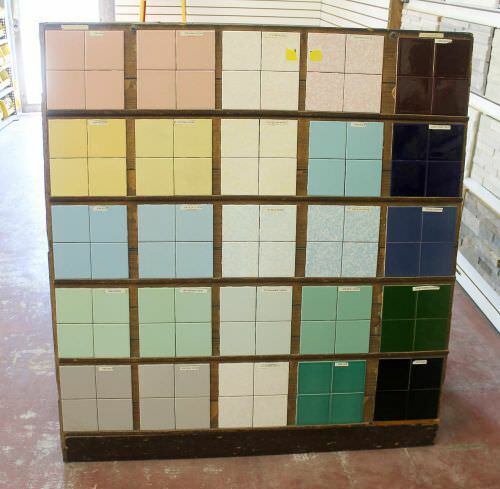 Thank you for the advice on where to find these colors and tile.